Before kicking off, I should ensure we are all on the same page and point out that a .jar file is just a zip file. It contains one or more .class files, where a .class file is a binary files containing Java VM byte code. The Java compiler, javac.exe, emits .class files that can be packaged up in .jar files using the jar.exe command, although Eclipse typically does this for you. The Project Cooper compiler emits .jar files as a matter of course. So, ignoring the somewhat crucial topic of how to write an Android application (I’ll loop back round to this subject with Project Cooper in time, having actually done this for Mono for Android here), I’ll work on the basis that you have an Android app all coded up and successfully compiled into a .jar file. There will be a directory hierarchy full of resources (images, layout files, strings and so on), probably called res, and also an Android manifest file called AndroidManifest.xml, which among other things, lists all the key application components and identifies the activity to launch when the app is started. First things first. 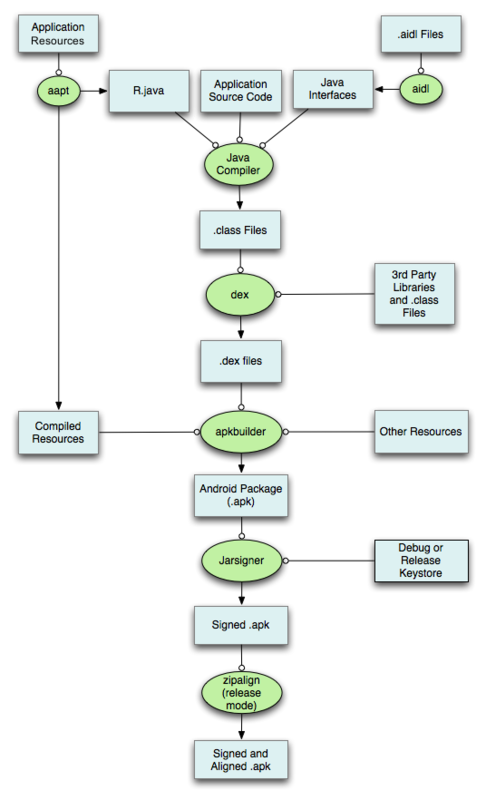 Using the Android SDK dictates that you are also using the JDK (Java Development Kit). To simplify the command lines it will be useful to put 3 directories onto the system search path. Two of these are from the Android SDK, which if you downloaded the executable installer, will by default be in your Program Files directory tree. Note: If you’re working with Windows Vista or Windows 7 you will need to remember to run the Android SDK Manager as Administrator to enable it to have permission to modify the content of its Program Files subdirectory. You can either add these to the system PATH or make a simple batch file that adds these to a local PATH each time you invoke it from a command prompt. In the steps below, I’ll assume I have a project in a directory called C:\Cooper\com.blong.Torch and in a command prompt I’ve already changed to that directory. In this case, the project has been compiled in the Debug configuration and so the compiled .jar is C:\Cooper\com.blong.Torch\obj\Java\Debug\com.blong.Torch.jar, the resources are in the res subdirectory and the manifest file is C:\Cooper\com.blong.Torch\Properties\AndroidManifest. Temporary build files can be placed in the C:\Cooper\com.blong.Torch\obj\Java\Debug directory. The project is being compiled against the Android SDK platform release 8 (the Android FroYo release, or version 2.2), so again it will be assumed I’ve used the Android SDK and AVD Manager to ensure I have that SDK platform installed. In my case I’m running on 64-bit Windows so any Program Files references will actually be Program Files (x86). Along the way I’ll set up some environment variables from the prompt just to hopefully ‘simplify’ the command-lines. The aapt command can now be run to collate all the resources from the res and output them to a designated zip file. jar cvf R.jar -C Java . This code temporarily changes directory into the obj\Java\Debug directory where R.java lives and uses the Java compiler, javac.exe, to compile it into a set of binary .class files in a directory hierarchy placed in a further Java subdirectory. jar.exe is then invoked and told to create a new .jar file called R.jar containing all the classes found in this new Java subdirectory with verbose output. The result of this is R.jar sitting next to R.java. Whilst this works just fine and dandy, it should be pointed out that the normal compilation process with project Cooper, using the IDE or MSBuild, will automatically generate a suitable Pascal file, equivalent to R.java, for consumption in a Project Cooper project. I'm not sure that will be invokable when doing a step-by-step manual build process as we are here, however, so adding R.jar into the project is fine in that case. At this point any remaining compilation tasks can be taken care of to produce the application .jar, and as mentioned, this application's .jar file is sitting in obj\Java\Debug\com.blong.Torch.jar. The dx.bat batch file has the role of invoking some process to analyse all the code in your application's .jar file and generate compact .dex code suitable for running on the Dalvik VM (the Java VM that Android uses). Annoyingly, and this may be due to dx being a batch file and also may be due to ignorance on my part for not working out how to get around it, dx.bat needs fully qualified names for the files you pass it. You might notice that it has sought out a keystore - a file containing a certificate - and by default apkbuilder will sign your package with this default debug certificate. This is handy as it saves you having to sign it manually. However, there are cases where you will need to explicitly sign your package. For example, when you develop an app that you want to sumbit to the Android Market you'll need to sign it with a specific certificate. This allows you to submit updates. Additionally, the debug certificate is only valid for 1 year from its creation point (when the Android build tools were first used). Also, if you want to use the Google Maps MapView class, you'll need to get a key from Google which will be based on the MD5 fingerprint of your application's certificate, so it makes sense to have one specifically for your app (or indeed for all your apps). So let's tell apkbuilder not to sign the package using the -u switch. We'll do that bit ourselves. if you omit the -storepass and -keypass switches you will be prompted for the password to the key store and the password to the key in the key store. Similarly, omitting the -dname switch will prompt you for all the parts required to make up an X.500 distinguished name. The idea is just to create a keystore once and then use that to sign your applications, making them all consistently signed. Android packages are signed using the Java jarsigner.exe utility. You feed it the unsigned package, a keystore and a keystore alias and it will output a signed package. If you don't specify the signed package name it will assume the same name as the unsigned package and overwrite it. The keystore password and key password can be passed on the command-line, or if not you will be prompted for them. Update: the -digestalg SHA1 parameter is there to keep things working if you have JDK 7 installed. JDK 6's jarsigner defaults to SHA1 for its digest algorithm, which is what Android wants, but JDK 7's jarsigner defaults to SHA-256. So specifying the right one is a good idea. I'll explain this form of adb command in more detail another time, but for now you just need to know that it works. There are plenty more possibilities for Android at the command-line. In another post I'll look at some other useful things we can do. Portions of this page (well, just the build workflow image really) are reproduced from work created and shared by the Android Open Source Project and used according to terms described in the Creative Commons 2.5 Attribution License.